This weekend saw an exclusive event organized by Ferretti Group to celebrate the delivery of the new Riva’s flagship, the first 37.5 metre Mythos superyacht. The Riva Mythos was launched in March, and her premiere took place at the newly opened Yacht Club de Monaco in presence of Ferretti Group’s new CEO Alberto Galassi, the yacht's designer Mauro Micheli, and Stefano de Vivo, Ferretti Group’s CCO. It was also the opportunity for guests to discover the Aquarama lounge, a space dedicated to the iconic Riva brand within the Yacht Club de Monaco. From outside, the Riva Mythos is simply beautiful with an elegant design complemented by her Regal Silver colour. Inspired by the successful Domino series, the Mythos retains the well planned proportions of her smaller sisters. Large decks offer various relaxing area for guests, from the stern to the foredeck including the sun deck with a Jacuzzi. 'We are both proud and amazed,' says Alberto Galassi. 'As an Owner of a Riva yacht myself, it is as if a new child or a new travel companion had joined our Riva family'. The Riva Mythos is entirely built in aluminium, a first for Riva. She was completed at Ferretti Group's CRN facility. This isn't the first time Riva and CRN have worked together – the yards also collaborated when Carlo Riva built some large yachts in the 1970s. The timeless and modern interior includes Canaletto walnut, white lacquered panels, white and dark leathers, chromium-plated steel and white floors in oak. The main deck accommodates the usual lounge and formal dining area, the raised pilothouse, but also an atypical and well-conceived full-beam galley forward, including a dining settee. On the lower deck, multiple layouts are possible. 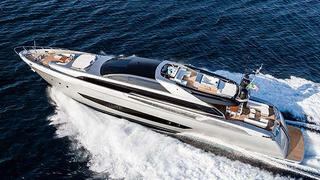 The first Riva 122 Mythos offers a three-cabin version accommodating up to seven guests. The full-beam master suite impresses by its volume and its full-beam bathroom, which hosts a sauna. The two other guest cabins have a double bed, one of them being convertible into twins with an additional Pullman. Crew quarters are forward for five crew members in three cabins. Powered by twin 2,580kW MTU engines, the Mythos superyacht is specified to achieve a top speed of 28.5 knots, a cruising speed of 26 knots and a range of 1,100 nautical miles at an economical speed of 11 knots. But during our sea trial, we easily reached a top speed of 29.2 knots at 60 per cent load. The engine room offers generous volumes for a yacht of this size, and twin stern garages respectively store a 5 metre Williams RIB and a SeaDoo jet-ski. Christened Sol, the first Mythos superyacht is now ready for her Brazilian owners, repeat clients of the yard. They will enjoy her along the Côte d’Azur and the Italian coasts this summer, until her official debut scheduled for the Cannes Yachting Festival mid-September.